If you’re a fan of the arcade game Frogger, Frogger Inferno might interest you—it’s regular Frogger, but with a fire trail. Sadly, the premise is a lot more exciting than the actual game. Your frog leaves behind a trail of fire so you can’t double back, but to most Frogger players, that's not really much of a handicap. While I can appreciate Konami’s attempt to update its hit game, Frogger Inferno is really not much more than original Frogger with a new coat of fiery paint. For those of you who haven’t played Frogger, the premise is pretty simple—the object of the game is to get your frog across the street and river and into five landing spots while avoiding obstacle like cars and alligators. Fill the five spots with frogs and move to the next level. The only difference between the original Frogger and Frogger Inferno is that, in Frogger Inferno, your frog leaves behind a trail of fire—so he can’t double back—at least not initially. While this may seem like a big obstacle, I don’t think a lot of people double back very often in Frogger—if anything, the fire trail is a small nuisance. The fire also disappears after a second or two, so you can double back (if you’re not dead), if you wait long enough. To control your frog, you can use three different types of controls—tap, slide, and tilt. Tilt control, while novel, is hardly useful at all—you have to tilt the iPhone back to neutral before you make each move, and it’s just generally not very responsive. Tap control is decent, but my favorite was the slide option—sliding your finger across the screen makes moving the frog easy and fluid and allows you to easily fly (er, hop) through levels. The graphics are not a huge upgrade from the original's pixelated graphics, and Frogger Inferno also misses out on the throwback/nostalgia feel by not being completely true to the original's look. There is a Facebook Connect option, so you can bug your friends with constant high score updates. Frogger Inferno's novelty burns out pretty quickly. It does have the added element of danger—er, fire—but said element doesn’t really change gameplay at all. 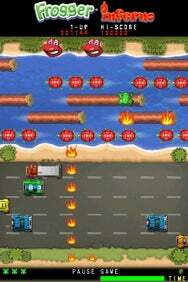 So it’s basically the original Frogger for the iPhone with slightly updated graphics. Still, at $0.99, it’s not a bad deal if you’re a dedicated fanatic of the arcade game.